Shoppers Stop is presenting its customers with the gift voucher worth Rs. 1000. Present your brother with this gift voucher so that he can buy items of his choice. Free Rakhi, Roli tika and Chawal are provided free with this voucher. Shoppers Stop is presenting its customers with the gift voucher worth Rs. 2500. Present your brother with this gift voucher so that he can buy items of his choice. Free Rakhi, Roli tika and Chawal are provided free with this voucher. 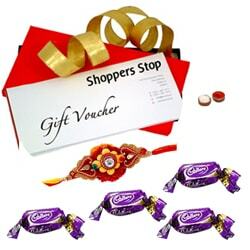 Shoppers Stop is presenting its customers with the gift voucher worth Rs. 3000. Present your brother with this gift voucher so that he can buy items of his choice. Free Rakhi, Roli tika and Chawal are provided free with this voucher. Shoppers Stop is presenting its customers with the gift voucher worth Rs. 5000. Present your brother with this gift voucher so that he can buy items of his choice. Free Rakhi, Roli tika and Chawal are provided free with this voucher.